· THREE SPEED DRAW NEXT FOR DIFFERENT LEVEL WHEEL: With the push of a button, you set the speed to slow, medium, and high. Higher speed, more fantastic drone. This mini-drone can help you improve your flight tactics. · USE A BUTTON AND HANDMADE TO ADJUST THE HEIGHT OF THE QUROPTERER: When you find it high, simply press the height button and lower the controller, very easy to control. 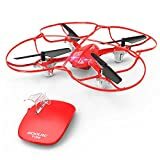 · 360 FLIP AND HIGH SPEEDMODE-RACING FOR ENTERTAINMENT: This drone can show the amazing side and 360 flip, allows you to play as a pro. Help yourself to reach your goal of flying in the sky.